Here’s a short video where I shoot the ultra small, internal cocking Autococker, made by Brahim Estephan. I posted a video shooting this tiny Autococker back in 2012, but after fixing a couple leaks I decided to record another video. Still needs some adjustment (lug heightened for quicker release and maybe changed sear and trigger springs). Left side view of the tiny internal cocking Autococker. 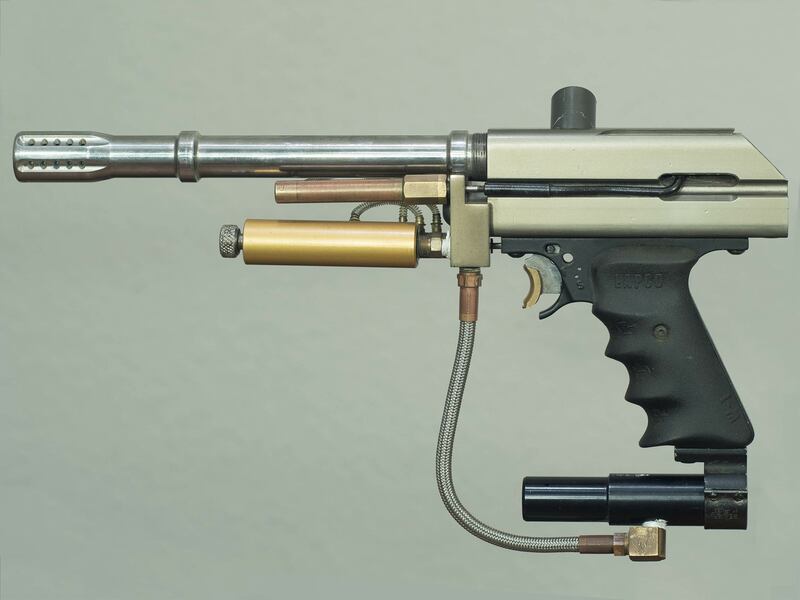 I added the Palmer LPR and the Female Stabilizer. 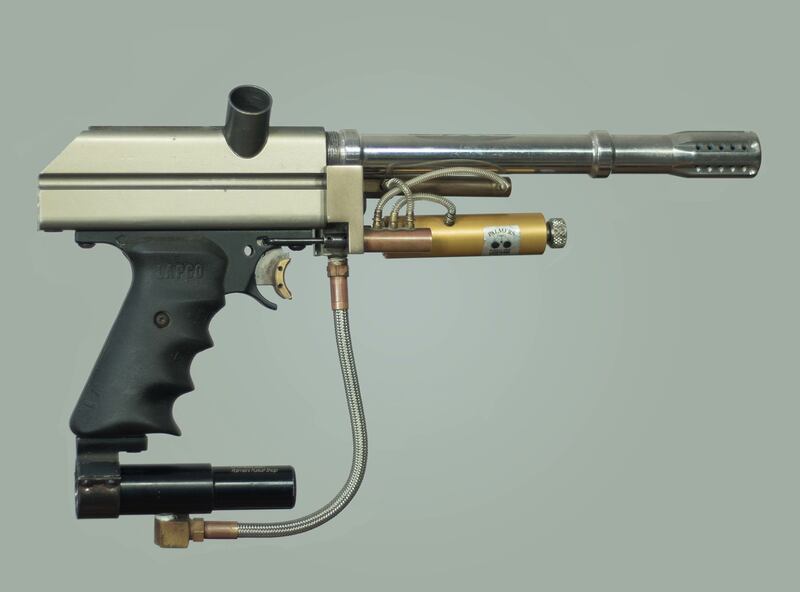 This Micrococker was built around 1992 by Brahim Estephan and supposedly predates Foxhunters half block Autocockers. Estephan gave this to Paul Schreck a couple years back and I traded Paul for it. A. NO DETENT so every shoot I took I was shooting two balls out. C. Front of body, barrel threads and frame are cut down in front. Only barrels with threads farther back towards the breech fit. D. Valve body was enlarged to get more air to the valve? E. The hammer is notched on top similar to modern half block cockers for recocking. And above is just the side profile shooting. I try to pull the trigger too quickly. F. The bolt cannot easily be removed so it’s a paint to clean. First remove frame, second remove lug and hammer, third remove bolt lug that hits hammer, then remove pump arm (try not to bend it!) and then slide the bolt out. Bolt reminds me of a cut down VM-68 bolt. G. Pull on trigger definitely needs some adjustment, probably springs and a different hammer lug. I just constantly short stroked it. I think a shorter lug so the hammer releases earlier would solve some issues. H. Milled in dovetail on the top of the body which I should add an armson site to. Right side of Brahim’s Micro Autococker. The Front of the body and the back of the body are both cut down. Definitely one of my favorite custom Autocockers and thanks to Paul for letting me add it to my archives. Find the other shooting video I did back in 2012 above.